This is the story of Angie, a devout Catholic who is pregnant with her fourth daughter, a child who has been diagnosed with conditions deemed “incompatible with life.” Angie is firm in her faith and vocal about praising God despite the circumstances of carrying a child that is not expected to live. She weaves in Scripture and stories from the Bible, but also finds room to express her doubt, sadness, and confusion with the Lord. I most related to her description of saying goodbye to her child and wanting to make sure she was warm. 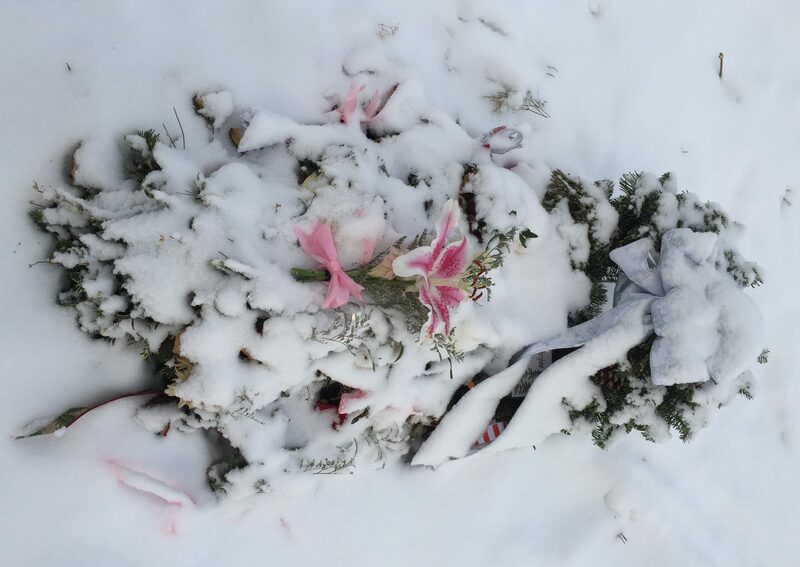 Since I buried Tinsley in December in Connecticut, the fear that she is cold is a recurrent theme for me. Although I don’t agree with some of the religious lines she draws, it was faith-affirming to read the words of someone so adamant in her trust in God. I definitely made me cry. She also includes some really helpful insights into helping her children process their sister’s death (see bottom). The room was silent in a way that I had never experienced silence. There is always room for doubt wherever God has made a way for faith. She is our child, and we are going to love her with the same intensity that we love our other girls. I admitted to myself that I was going to need help to get through this season of life. And as the rain fell, the wipers wiped, and the Lord listened, I let Him into a place I had never fully invited Him before. A place of communion where I could rest knowing H heard me. It is hard to accept that anyone, even the God of the universe, could love your child the way that you do. They were the tears of a mother who was just beginning to understand how much she had taken for granted in this life. We saw each other for what we were — women who were often just going through the motions of normalcy, partly for our children and partly for ourselves. I began to realize that this was going to be a part of my new life because the world has a way of going on all around you, even when you are in the depths of sorrow that belie its pace and fervor. I remember talking to her, but I don’t recall all of the things I said. I know I told her I loved her….right before our eyes, she passed from this world to the next, and all she had ever known was love. Even as our hearts rage within us, He stands, ever present, and embraces our pain. I clung to her, staring at the door, keenly aware a part of me was going to go with her, never to return….she was cold, heavy with the sting of mortality. I wrapped her blanket tighter. I knew it couldn’t warm her, but it was the only thing that made sense. I made sure her dress was on underneath, and as I bundled her up, I lowered my face to hers for the last time and told her what was going to be happening. I knew she wasn’t there anymore, but the mother’s heart doesn’t know how to stop loving, even in the wake of death. It was everything I could do not to jump from the bed and, like a woman possessed, chase through the hospital and find her. I remember the feeling of absolute panic and shock when I saw her little coffin. We serve a God who is aware of our suffering. So what is it like to live life after losing a child? I guess that depends on the day. You catch yourself doing things that a sane person wouldn’t do, and yet it doesn’t seem like there’s another logical option. It’s a really delicate balance between letting yourself grieve the way you need to and functioning in a world that keeps reminding you of what you have lost. I have more gaps between really bad days, but the pain isn’t going away. No pretty words were said, only the arms of a woman who made herself present and invited herself into the sorrow. It’s a place most people run from, and it’s refreshing and healing when people enter in. People’s natural instincts are to rush us through our grieving because they love us so much. A time will come when we are ready to take the next steps, but that is between the Lord and ourselves. I didn’t feel like I lost a baby; I felt like I said goodbye to someone I had always known, who had been my daughter for years and years. Toddlers have trouble understanding the idea of finality. We felt like she understood Audrey was dead but not necessarily comprehending that she wouldn’t ever be back. …as a general rule they were typical preschoolers in that the world appeared black-and-white. Traffic lights are either red or green. They are trying so hard to grab hold of “the rules of life” that they have a hard time digging around the areas that aren’t’ simple. While you don’t want to overwhelm your child with details, do include them in the knowledge you have available. Children are much more likely to express difficult feelings when they are somewhat busy with something else. They know when you’re sai, and the more you alienate them from your emotions, the more you tell them they shouldn’t either. Tell them you’re sad. Tell them you wish the child were still alive. Tell them that sometimes at night you cry too because you don’t understand why it had to happen. By being transparent, you will show your children that you can handle their feelings, and they will be much more likely to share their hearts with you. Try as hard as you can to keep your family’s routines intact. The need to follow a normal routine also includes being consistent with discipline. Many times we want to go easy on our kids because we feel like they are acting out against the situation, but the reality is that they will feel more secure when they see that the boundaries lines haven’t shifted. Children who have lost a sibling need constant reminders that they are just as special as the child who is gone.